Welcome to Mr. Gus's Journal: New UF article on catching that pesky Armadillo. 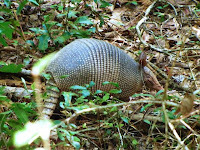 New UF article on catching that pesky Armadillo. You know the scientists at the University of Florida / Institute of Food and Agricultural Sciences (IFAS) do the best job at studying and reporting on issues that concern us all. When I was a young man we used to trap and BBQ these critters, and now as a Florida home owner they're continually digging in my yard, driving the dog into a barking frenzy! Here is a good article I'd like to share that was just announced. Baiting the Nine-banded Armadillo - What is the tastiest treat to tempt an armadillo? 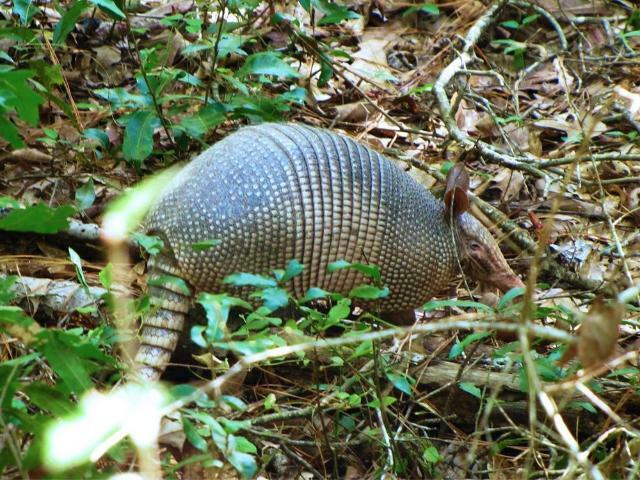 Armadillos are one of the most significant nuisance pests in Florida and much of the Southeast. There are no repellents, toxicants, or fumigants registered for use with them. They are good at both burrowing beneath and climbing over fences. There are also no effective methods for baiting them into traps. So the authors of this 3-page fact sheet set up a test to determine which materials have the greatest potential to serve as bait. Written by Holly K. Ober, Lucas W. DeGroote, and Russell F. Mizell III, and published by the UF Department of Wildlife Ecology and Conservation, December 2011. An excerpt, Armadillo feeding activity causes damage in a wide range of locations such as lawns, flower and vegetable gardens, golf courses, sports fields, cemeteries, nurseries, and orange groves. Armadillos have been blamed for reducing bobwhite quail and sea turtle numbers because of their fondness for quail and turtle eggs. Armadillos are also blamed for causing structural instabilities when they dig burrows around and under buildings. In sum, they are one of the most significant nuisance pests in Florida and much of the Southeast. For the entire article click here. Soon I'll post some recipes for your enjoyment. Get outside to boost your happiness. Keep your family safe by locking your guns. Colleges with active shooting sports programs. How familiar are you with the Bobwhite Quail?